Our hotel is situated in the centre of the city, 20 meters from the main street. 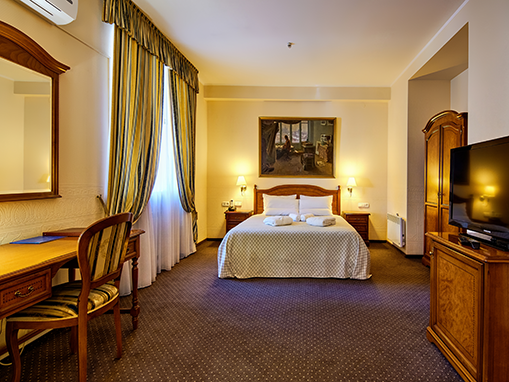 Hotel ACADEMY ensures excellent possibilities for spending time in comfortable and quiet conditions. The beds in our hotel are very comfortable. We are very attentive in choosing mattresses, pillows, and blankets. That's why all that we offer to our clients - linen, equipment, furniture and even interior - are of the highest quality - because there are no trifles in hotel business! Our visitors will be satisfied with all around the clock service. Bar-restaurant "Garage" is situated on the first floor of the Hotel "Academy". You can find the bright interior, warm and friendly atmosphere at the restaurant. An extensive European menu and a "freestyle-bar" is complimented by a wide selection of wines, cocktails, a tea list and fresh juices. "Garage" is famous also for its attentive service from professional staff and high quality live music.